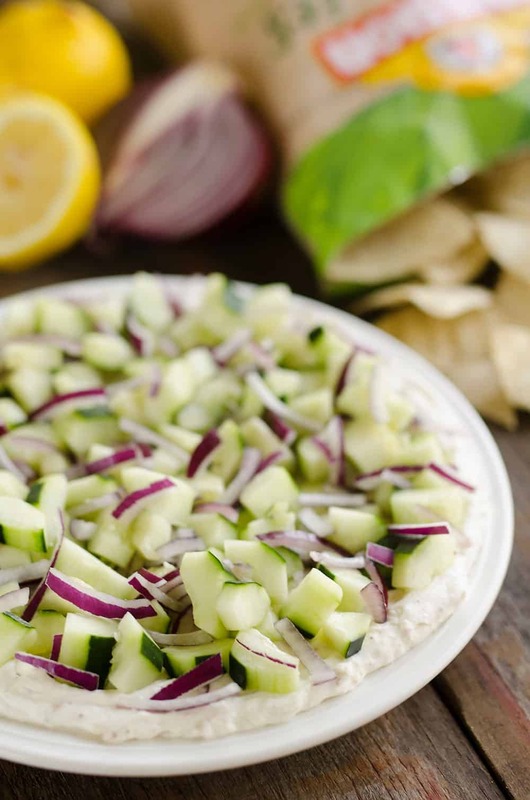 Creamy Cucumber Layered Dip is an easy 10 minute recipe perfect for a flavorful summer snack. 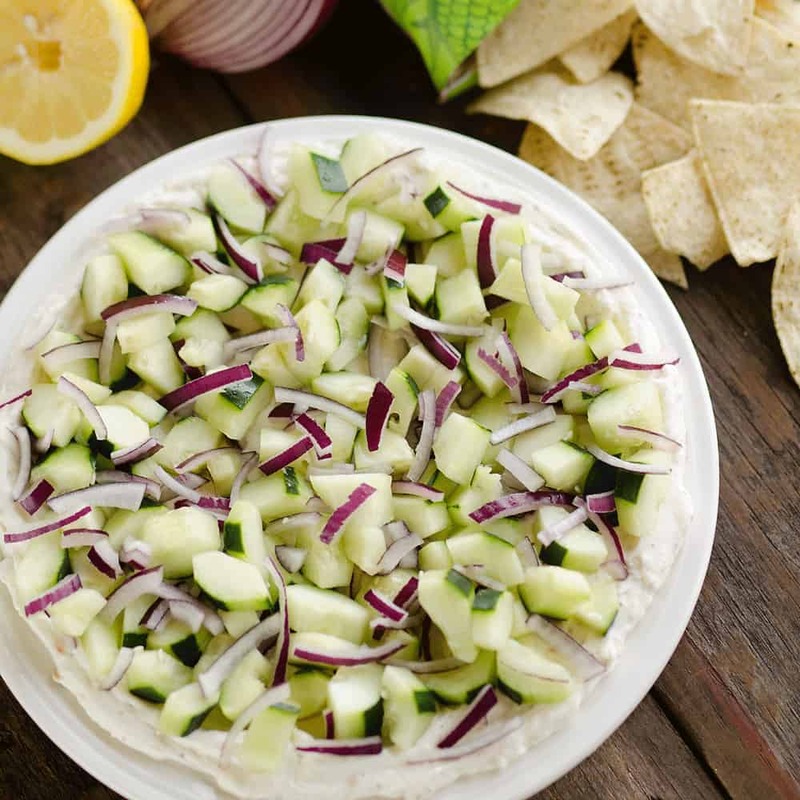 A lightened up layer of creamy goodness is topped with fresh cucumbers and onions and served with Mission Organics Tortilla Chips for a wholesome dish you will love! Who doesn’t love a good layered dip in the summer?! When we are camping for the weekend, gathering for a holiday or just getting together for no reason, our family is all about a delicious dip. 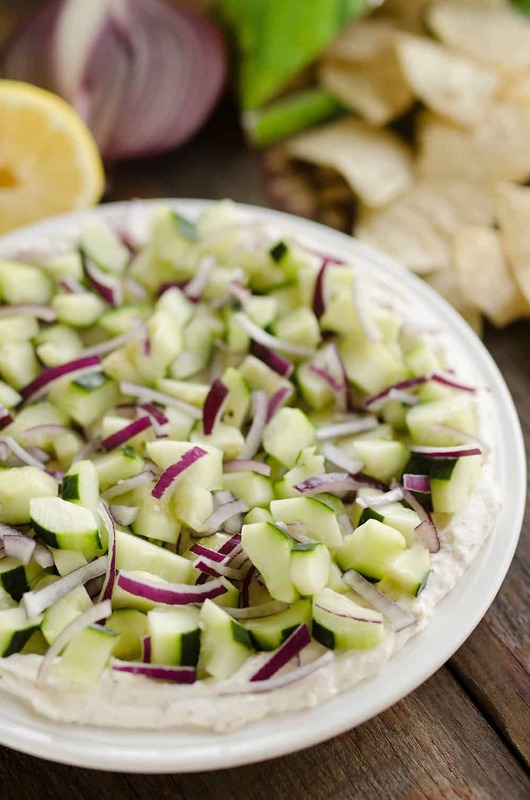 Whether I whip up a Skinny Taco Dip or this Creamy Cucumber Layered Dip for something new and fresh, everyone always loves gathering around a good dip and snacking on it with chips. 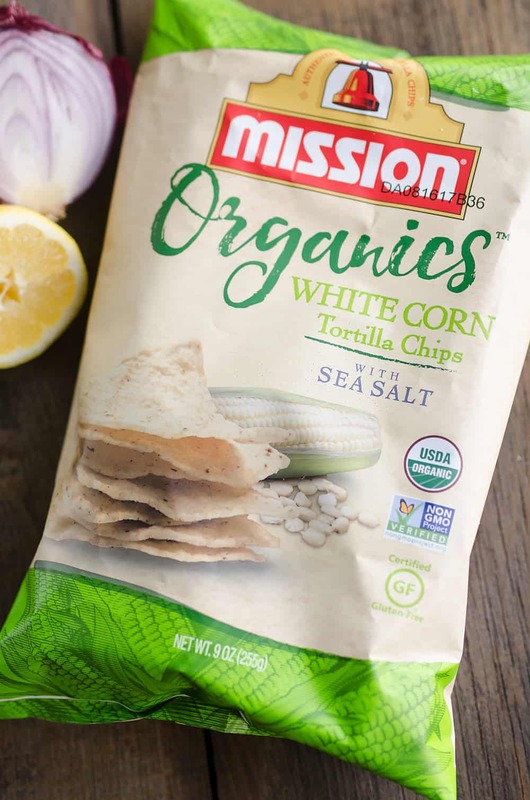 My new favorite chips to pair with any dip I serve are Mission Organics® Tortilla Chips. 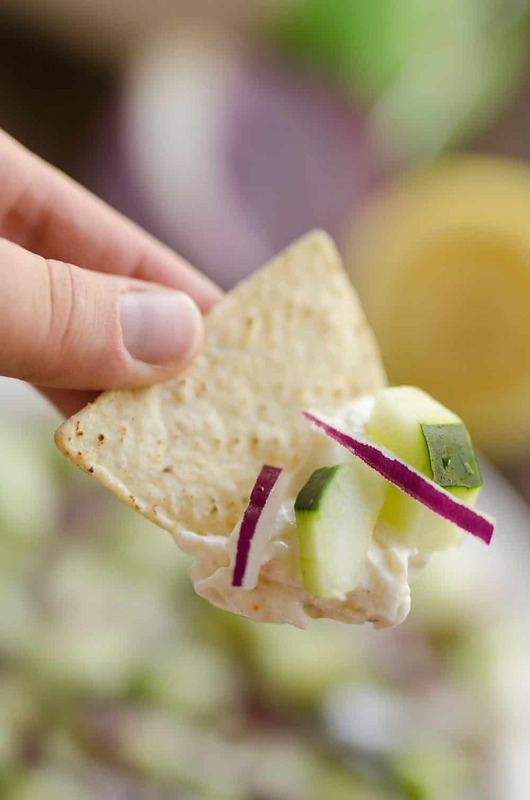 I always feel best serving fresh and organic foods, so I paired this Creamy Cucumber Layered Dip with classic Mission Organics White Corn Tortilla Chips with Sea Salt. If you are looking for a little more variety in your chips, check out Mission’s newly introduced Yellow Corn and Multigrain Tortilla Chips. I adore their Multigrain Tortilla Chips with all the extra flavor and texture the grains provide. 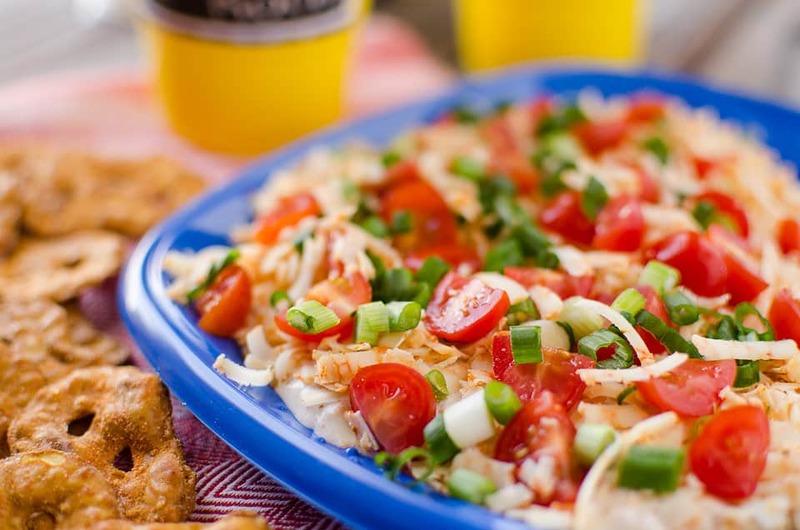 My family likes to keep things simple and familiar though, so I stuck with the White Corn Tortilla Chips for this recipe. Mission Organics Blue Corn Tortilla Chips are also a great option with dips or salsas. I have used them with this fun Patriotic Flag Parmesan Garlic Chip Dip or when I am really in a pinch for time and need to bring a dish to share, I will pick up a bag of these and serve them with a mango or pineapple salsa. It makes for a visually beautiful, fresh, and delicious dish, but most importantly, so incredibly easy. Regardless of which variety you choose for your next recipe, you can feel good about choosing this wholesome product! Not only do Mission Organics Tortilla Chips taste amazing, they’re USDA organic certified and non-GMO project verified. The best part of all is that you don’t have to search high and low in specialty stores to find these awesome chips. They are available at local retailers everywhere. 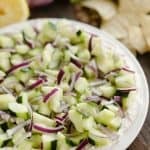 I picked up a couple bags at Cub Foods along with a few other ingredients I needed for this Creamy Cucumber Layered Dip. I am all about one-stop shopping for groceries! If you are curious where you can grab a bag, check out the store locator at the bottom of the Mission Organics website. You can also browse lots of other great recipes there too. I found these Tequila Guacamole and Cheese Nachos that are calling my name. They are most definitely next up on my party menu for a new recipe to try! 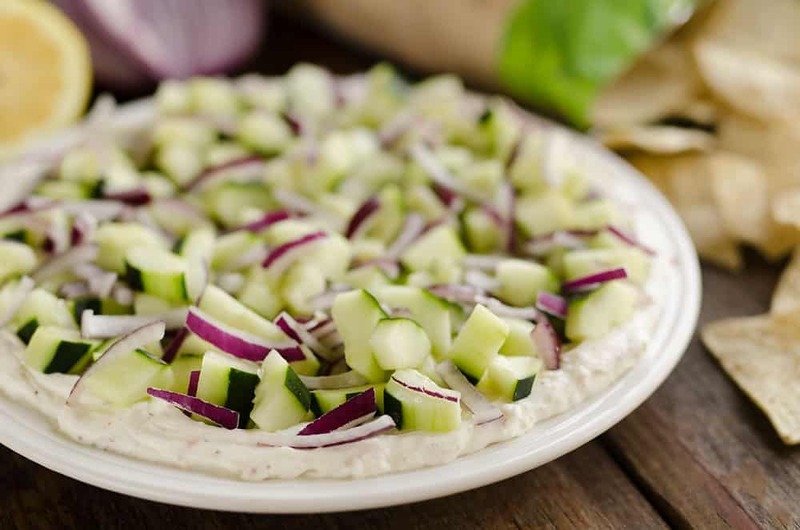 Swing by your local grocery store and grab a few ingredients to whip up a plate of this Creamy Cucumber Layered Dip. All you need is cream cheese, Greek yogurt, Italian seasoning, lemon, cucumbers and onions. Pair this easy appetizer with Mission Organics Tortilla Chips for a dish that is ready in only 10 minutes and everyone will love! In a medium bowl, add the cream cheese, Greek yogurt, lemon juice and Italian seasoning. Mix until smooth and spread the mixture evenly over a 12 inch plate. Top the creamy mixture with chopped cucumbers and red onions. Serve chilled with Mission Organics Tortilla Chips. 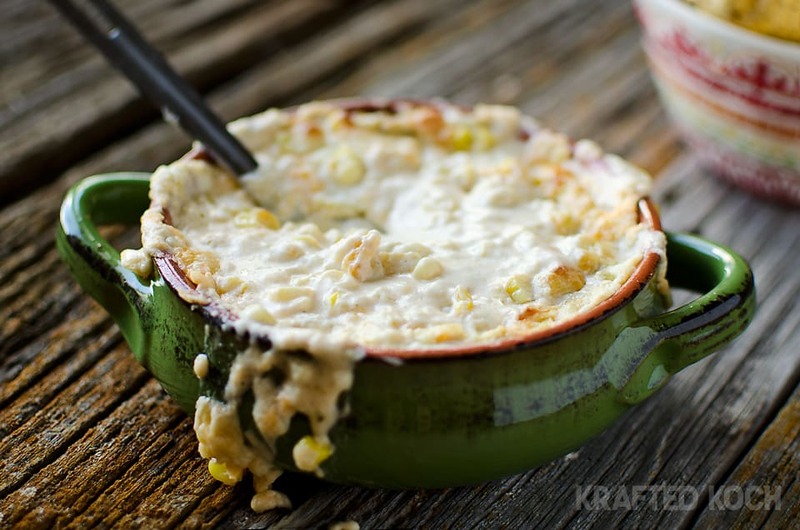 More great dips to pair with Mission Organics Tortilla Chips!